The average smartphone’s battery provides around 2,500mAh of power—usually enough to get you through the day. Anker’s new PowerHouse, which is about the size of a cinderblock, boasts 120,600mAh. You can use it to recharge your phone for up to 40 days straight if for some reason your power has gone out. It’s not limited to only topping up your smartphone, either. In addition to four USB ports on the front, there’s also a 12-volt DC outlet for powering gadgets designed for your car, and a standard three-prong outlet for powering anything that plugs into a wall. The PowerHouse can recharge a laptop 15 times over, or even keep a mini fridge running for up to seven hours. When the PowerHouse eventually dies it can be fully recharged in about 10 hours using it’s included charger, and instead of four little glowing dots providing an estimate of its remaining charge, a large LCD display provides a far more accurate prediction of when it will eventually be tapped out. 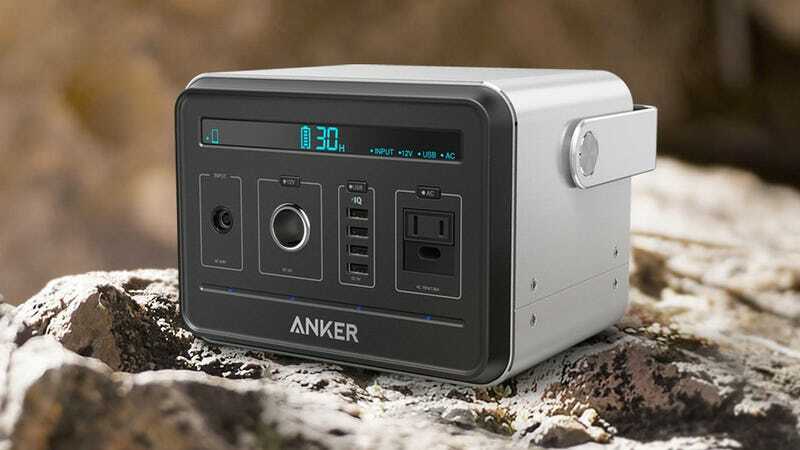 At $500 it’s priced similar to a low-end gas generator, which you might still want to consider for the post-apocalypse given fuel might be easier to find than a working outlet to charge this giant battery. Luckily, Anker has also promised a solar charger for the PowerHouse that can bring it back to life in about 16 hours. Not bad for a power source that fits in the trunk of your 1973 Ford Falcon XB GT coupe.